There are many groups of items that enable a satellite infrastructure to work. A detailed examination is needed to understand the operation of the overall system. 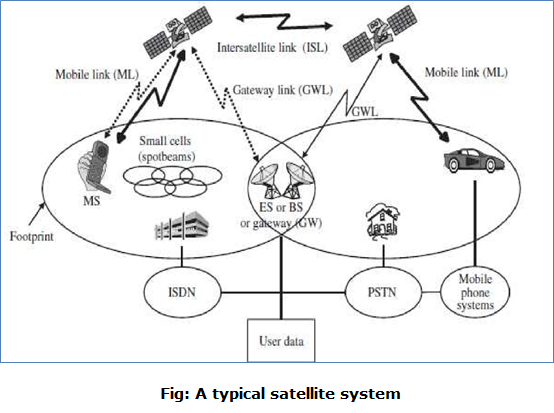 Once a contact has been established between a mobile system and a satellite using a LOS beam, almost everyone in the world can be accessed, using the underlying hardware backbone network on the surface of the earth. The satellites are controlled by the base stations (BS) located at the surface of the earth, which serves as a gateway. Inter-satellite links can be used to relay information from one satellite to another, but they are still controlled by the ground BS (also known as earth station or ES). The illuminated area of a satellite beam, called a footprint, is the area within which a mobile user can communicate with the satellite; many beams are used to cover a wide area. In addition, satellites are constantly rotating around the earth, and a beam may be temporarily blocked either due to other flying objects or the terrain of the earth's surface. 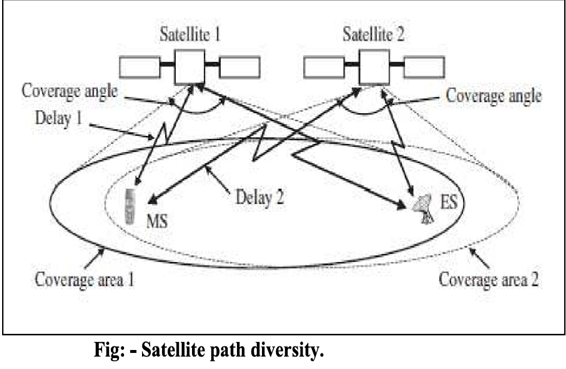 Therefore, a redundancy concept, known as diversity, is used to transmit the same message through more than one satellite, as shown in the above figure. The basic idea behind path diversity is to provide a mechanism that can combine two or more correlated information signals (primarily the same copy) traveling along different paths and hence having uncorrected noise and/or fading characteristics. Such a combination of two signals improves signal quality, which enables the receiver to have flexibility in selecting a better quality signal. The primary interest is with path diversity, though other forms of diversity such as antenna, time, frequency, field, or code, are possible. Path diversity will depend on the technology that is used to transmit and receive messages. The use of diversity can be initiated by either the MS or the BS located on earth. The diversity request from the BS (ES) enables the MS to locate and scan un-shadowed satellite paging channels for unobstructed communication. Elevation angle: Higher elevation angle decreases shadowing problems. One approach is to initiate path diversity when the elevation angle becomes less than predefined threshold. Signal quality: If the average signal level (in DB), quality (in BER), or fade duration goes beyond some threshold, then path diversity can be used. Signal quality is a function of parameters such as elevation angle, available capacity, current mobility pattern of the MS, or anticipated future demand. Stand-by option: A channel can be selected and reserved as a stand-by for diversity whenever a threshold crossing is detected by the MS. Such a standby channel is used only when the primary channel is obstructed. Since the use of diversity is considered a rare event, several MSs can share the same standby channel. Emergency handoff: Whenever a connection of a MS with a satellite is lost, the MS with satellite is lost; the MS tries to have an emergency handoff. The ES (BS) constituting the heart of the overall system control. The ES performs functions similar to the BSS of a cellular wireless system. The ES keeps track of all MSs located in the area and controls the allocation and de-allocation of radio resources. This includes the use of frequency band or channel in FDMA, time slot for TDMA, the code assignment for CDMA. Both MSC and VLR are important parts of the BS and provide functions similar to those for the cellular network. 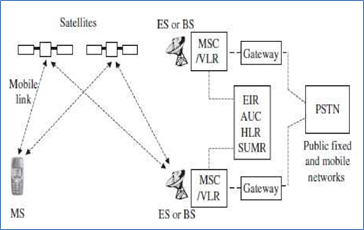 The database EIR (Equipment Identity register), AUC (Authentication Center) , and HLR also perform the same operations as in conventional wireless systems and are an integral part of the overall satellite system. The HLR-VLR (Home Location Register - Visitor Location Register) pair supports the basic process of mobility management. A satellite user mapping register (SUMR) is also maintained at the BS to note the locations of all satellites and to indicate the satellite assigned to each MS.
All these systems are associated with the BS to minimize the weight of satellites. In fact, satellites can be considered to function as relay stations with a worldwide coverage, given that most of the intelligence and decision- making process is performed by the BS. These BSs are also connected to the PSTN (Public Switching Telephone Network) and ATM backbone through the appropriate gateway so that calls to regular household phones as well as to cellular devices can be routed and established. Intra - satellite handoff: There could be handoff from one spot beam to another due to relative movement of the MS with respect to the satellites because the MS needs to be in the footprint area to communicate with a satellite. Therefore MS moves to the footprint path of another beam, there would be an intra-satellite handoff. Inter - satellite handoff: Since the MS is mobile and most satellites are not geosynchronous, the beam path may change periodically. Therefore there could be a handoff from one satellite to another satellite under control of the BS. BS handoff: A rearrangement in frequency may be desirable to balance the traffic in neighboring beams or the interference with other systems. There could be situations in which satellite control may change from one BS to another because of their relative locations. This may cause a handoff at the BS level, even though the MS may still be in the footprint of current satellite. Inter-system handoff: There could be a handoff from a satellite network to a terrestrial cellular network, which would be cheaper and would have a lower latency.